If you live in Texas, you know that fall isn’t really “fall”. It’s a season that we play dress up in our boots, scarves and sweaters then regret your decision by the afternoon. And where I live is no different. This 90 degree business gets old but it doesn’t stop me from bringing some decor to my porch even if the real pumpkins were a pain in the rear to find in September. But bear with me. 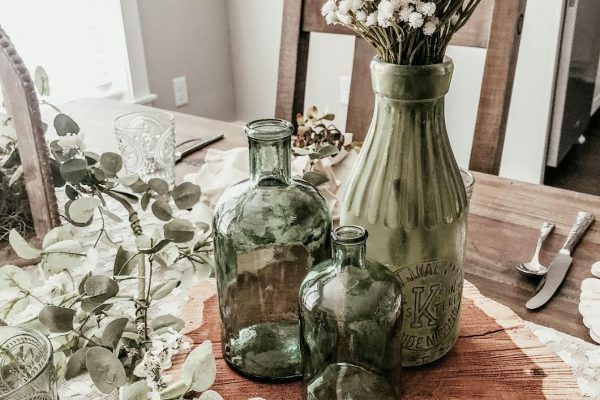 What’s special about this post is that I’ve teamed up 10 of the most talented bloggers on the web to bring you their own amazing fall space. 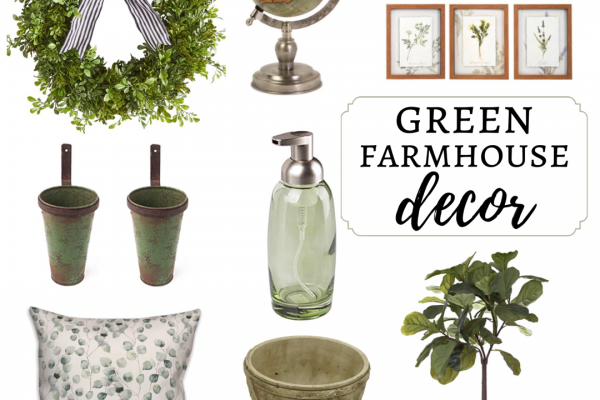 Be sure to check out all of their spots at the end of this post! What’s always an unspoken rule that I tend to follow with any decor space is reusing as many year round pieces as possible. For my porch that included the Welcome sign, tile mat (tutorial here), bench cushion, and apple baskets. 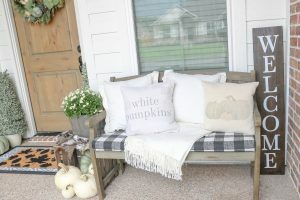 For my porch bench, all I had to add was some seasonal pillows. One of my favorite small pillow shops that I’m sure you’ve seen around the gram is Linen and Ivory. They have so many options that just choosing a few of your favorites is the hardest task! And for the bench cushion, thankfully I picked a pattern that has appeared in decor spaces for every season so I feel good about leaving this patterned cushion out all year! Now pumpkins were the tricky part. I have the hardest time finding live pumpkins that have the color and character that I was satisfied with. Again, this is mainly because it’s still so hot this time of year. 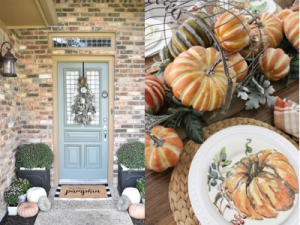 So if I happened to sneak in a few of my faux pumpkins into the mix, then so be it! At least I don’t ever have to worry about replacing them. I was ecstatic to finally get a Marshalls in my town and found the cutest apple baskets with leather handles for such a cheap price. One of my favorite finds for sure! My tile mat is probably my favorite project. This is because I can custom make it to look any way I want. You can find the tutorial for my tile mat here. 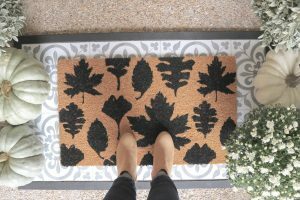 I love this idea because it is such a cost efficient way to layer door mats! This seasonal one on top I snagged at Target. 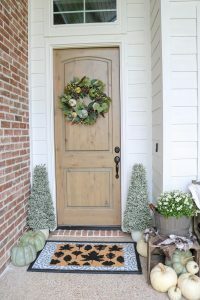 Although my porch is nothing over the top, I hope you were able to spot a few ways you could jazz up your front door space without spending too many dollars! Now it’s time to check out to see the spaces that my friends have created. Don’t forget to check theirs out below! Subscribe to catch the latest posts from The Picket Fences! Lauren, you did an amazing job on your front porch!! That was so fun to see all that you came up with. Have a blessed day friend. Darling! That whole bench situation is 😍😍😍. Love your porch!! LOVE it!! The buffalo check is soo gorgeous! Lauren you’re such a doll! 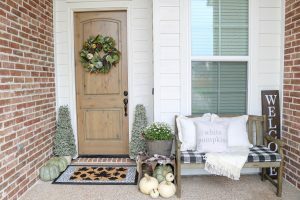 Love your fall touches and super saavy tips!! So fun joining you in this blog hop today!! Lauren! You’re such a doll! 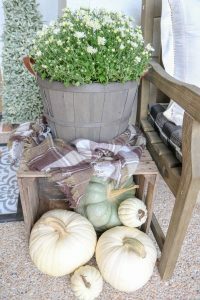 Love your fall touches and saavy tips too! So fun to be in this hop with you today!! 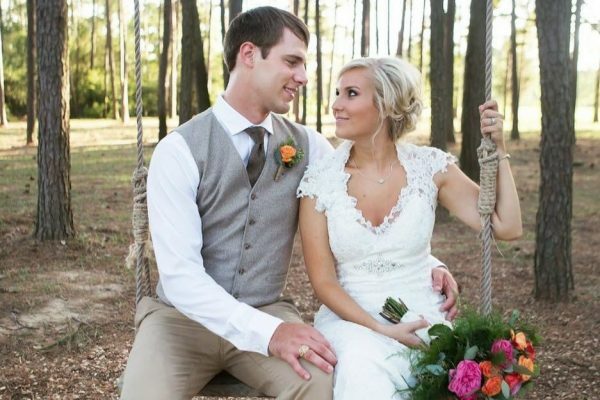 Lauren, I love using the same pieces all year and then just adding touches of the season too! Your porch looks so pretty! 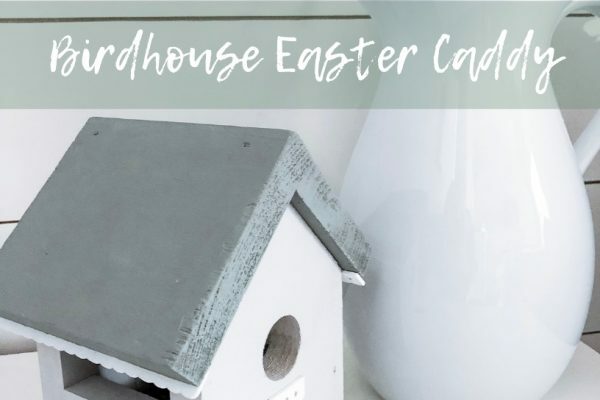 So fun to do this blog hop with you!! That tile doormat is amazing!! I am in Texas too and it is just too darn hot!! Come on cool weather! Layered rugs for the win!! Looks beautiful and so welcoming!